One of the things I have always loved about the Maker Movement was the diverse community that loved to share their ideas. 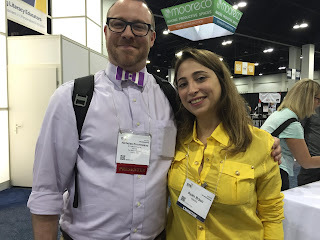 I felt very welcomed by many different people that supported my exploration of Makerspaces and helped point me in the right direction if they couldn't answer my many questions. Now, I have teachers coming to me with Makerspace questions and I return the favor. It truly is an important part of the Maker Movement. However, every community has its Negative Nellies. There are many different approaches to starting Making in your school or classroom. Some might have admin buy-in and the money to dive in and buy tons of goodies for a space. Others might not have that support and are trying to stretch their budgets to support student-led inquiry. Some educators might have an excited student and teacher base begging to get their hands dirty in a Makerspace and others might have a small group of interested students and a resistant teacher base. All Makerspaces are not going to be built the same way for the exact same reasons. That is OK! I've seen crazy heated conversations erupt over LEGO walls and Makerspace Challenges. Personally, I think having a LEGO wall where kids can just build and do silly things is cool, but I do not know I would put it in a high school Makerspace. Maybe they would love it. I hoped if I did decide to try it, I would get support from teachers and not blow-back on how I'm not creating a "real" Makerspace. I love the idea of challenges and think that it could be a nice component of a Makerspace. Some students are not sure where to start, so a pack of challenges that encourages students to explore different aspects of the space would be a nice way to introduce different Maker ideas to various students. It should not be the only way a student is allowed to interact with a Makerspace, but one element of it. Every Makerspace is designed to be different and each educator needs to keep that in mind while they building one and before they criticize one. Lastly, the Maker Mentality is the most important thing educators want to see installed in their school. With the right mentality, every space can become a Makerspace. I think many educators realize that, but you have to start somewhere. Sometimes the environment is ripe for an entire part of the library to be a Makerspace and other environments need to start with a cart that goes from class to class to support specific teachers ready to embrace the idea. Again, every school and educator is in a different place and they are all working to bring the tools, skills, and mentality to their students. These teacher has the best intentions for their learning environment and they, like all of us, will make mistakes along the way. Trashing their attempts to provide these opportunities to students is not helping and truly antithetical to the Maker Mentality. Try something new, see how it works, iterate if it fails, look for support from the community, and try again. Repeat as needed. Why should creating a Makerspace be any different? TED is looking for fresh new student voices to share from the TED stage. 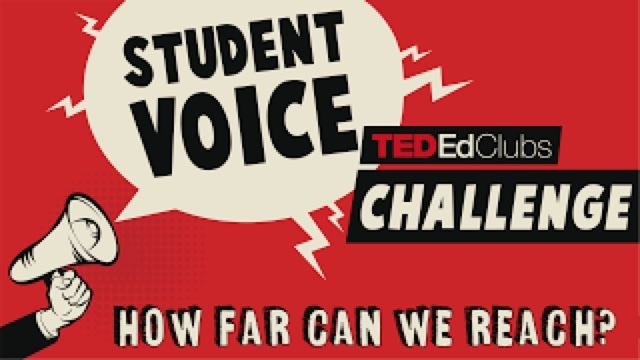 Our student voice initiative, TED-Ed, is launching the TED-Ed Clubs Challenge to surface student stories from around the world. So far, more than 25,000 students have given TED-style talks in their schools and communities through TED-Ed Clubs. We are inviting students, ages 8-18, to share what they would say if the world were listening, and we want to include your answer! Sign up for a quick video chat to learn more. You’ll speak directly with a member of the TED-Ed team to learn everything you need to know about the Challenge and how to get involved with this awesome global community. Use Nicholas Provenzano as your referral code on the TED Ed Club application. July 14th is #semicolonEDU day. It is a day for teachers to talk about Mental Health issues in education. 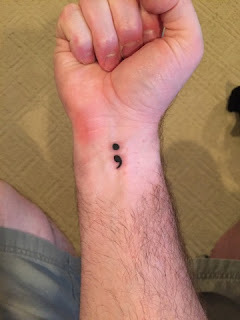 My post from a couple of years ago details the start of #semicolonEDU and my post from three years ago details my battle with mental health issues. Mental Health issues should not be ignored in education. An estimated 3 million adolescents had a major depressive episode in 2015. That's 12.5% of all children aged 12-17. Almost 10 million adults have dealt with it as well. That's 4% of all over 18 people. Those numbers are simply scary. However, they can be less scary if we embrace these issues and talk about them. The more that people are open about mental health issues, the easier it is to erase the stigma associated with mental health. We need educators and students to know that it is ok to talk about it and share those experiences. Without talking openly, people will hide and think they are alone. As an educator, I can't let that happen. a. Share a picture of a semicolon drawn on you in support of #semicolonEDU and share it on social media using the hash tag. b. Share a picture and a story if you feel comfortable. The more stories out there, the more people will talk about and feel comfortable sharing their mental health battles. I hope all of you will share this story and offer support for those willing to share their battle. I've always thought that PBL lead very naturally, for me, to Making and Makerspaces. As I thought more about it, the two concepts can both be approached the same way in the classroom. That is good and bad though. There are approaches that some call PBL or Making, but fall a bit short for me. There are three steps to PBL and Making that should be explored by educators looking to introduce these practices in the fall. Having student create exactly what the teachers has asked for is Teacher Controlled PBL. It is not true PBL. It is having students follow a recipe and just being compliant. Very little creativity is allowed or needed to complete the task. Having students work in a Makerspace creating exactly what the teacher has asked is not true Making. It is follow directions and doing as they are told. It's not very fun and the students might appear engaged, but they are just going through the motions. This version of Project Based Learning has the teacher putting some constraints on the project or adding specific aspects that must be addressed in the project. This is closer to pure PBL, but the teacher still has too much say in the process. Teachers sometimes put out tasks or ask students to complete projects with broader guidelines in the Makerspace. A teacher influenced Maker project is close to pure Making, but it still has too many teacher fingerprints. The purest form of Project Based Learning is Genius Hour/20 Time. This is the purest form to me because it allows the student to choose what they want to learn and how they are going to demonstrate what they learned when they are done. The student is in full control of their learning from start to finish and the teacher provides whatever support the student might need along the way. Pure Making is exactly the same thing. Word for word, it is the same. Students use the Makerspace to explore their passions and share what they have made and what they learn in ways that work for them. The teacher acts in a support fashion if needed. I want to stress that Step 1 and 2 are ONLY bad if that is the only way that PBL and Making are approached. If educators stop and Step 1 or 2, the students are not getting a full PBL/Maker experience. Teachers should start with Step 1 and model the process of creating the project with the students. Next, Step 2 allows the students to see how choice can come into play for projects. Lastly, Step 3 allows the students to explore learning on their own and the teacher provides support as needed. Like all things in education, this is not the end all be all approach to Making or Project Based Learning. This is what I've noticed over the past few years of using PBL and Making in my classroom and school. Do you have something to add that I missed? Is there another step? Share it in the comments.